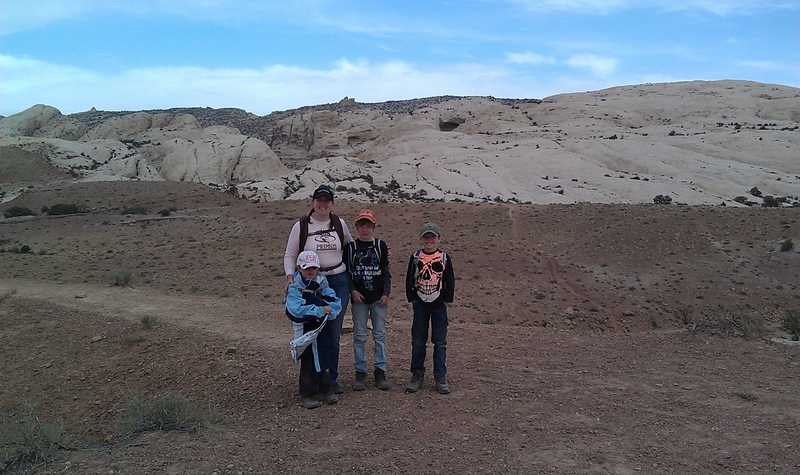 Occasionally we like to take the time to explore some of the non-motorized trails in and around Utah too. Most of the trails we hike are within a short distance from our favorite riding areas or trails and can be done as a break or in conjunction with a ride. This hike is a very easy hike that nearly anyone can enjoy. It is on the way to Goblin Valley and can be explored in conjunction with the park Although it is not in the park and you will not need to pay a fee to hike this trail. It is also near many of the motorized trails in the San Rafael Area specifically the Waterfall, Orange, Behind The Reef and others and could be visited in conjunction with a ride(assuming you bring hiking shoes). You will however have to travel a short distance on a paved road. The hike is just under 1 mile each way with less than a 200 foot elevation gain. The caves and cave style natural bridge sometimes referred to as Wild Horse Window is an impressive site. 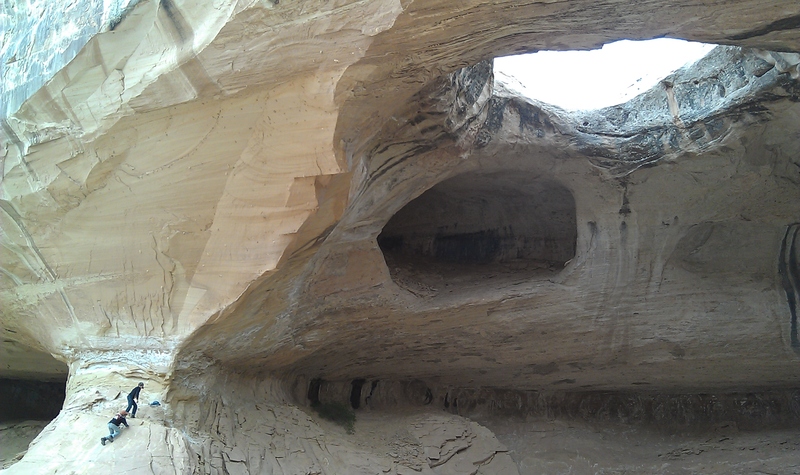 The actual skylight measures 35-feet by 22-feet, but the size of the caves are hard to appreciate until you visit. The features are massive and pictures can not do it justice. 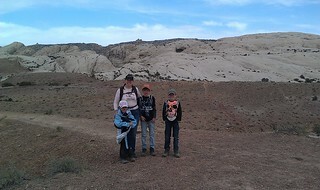 It's worth the short hike to see and kids will not get bored along the way. 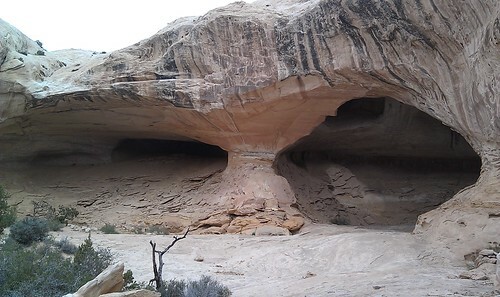 The cave is visible from the trail head as you park your vehicle. 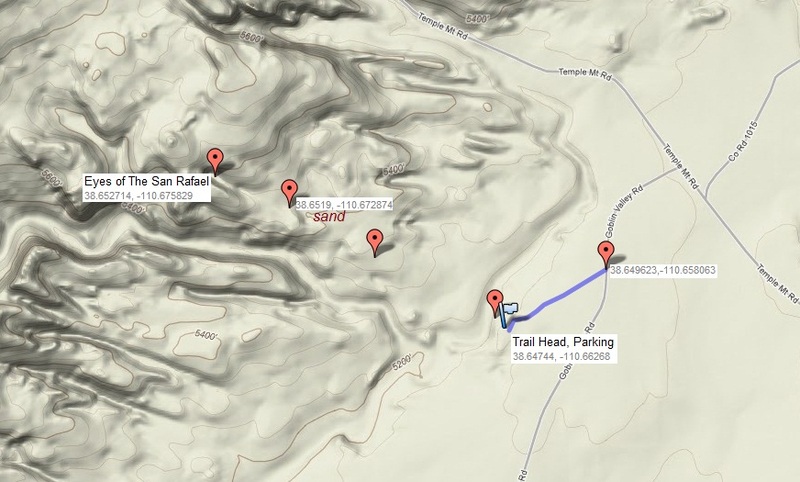 A GPS can be used and I've included a map below, but it's not required by any means as you can simply take a sighting on the cave and make a beeline for it. Once on the slickrock there are carins to guide you. 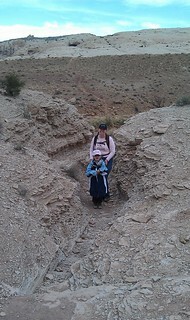 We had to track to the right a bit as we came to a slight downhill and crack. There is a low sandy section you will follow just before reaching the cave. This trail can be hiked at any time during the year, although it does get hot in the summer so spring and fall are best. It was just right the day we hiked it in early May. There is shade in the cave and it's fun to take a snack and have a short rest here for the kids. It's fun to explore in the cave a bit and climb around as well.